Skilled nursing brings with it many challenges for a new therapist, including the occasional difficult patient. If you work in a facility that treats Medicare A patients, you may feel the pressure to acquire a planned number of treatment minutes per day. This task is made more difficult on the days that difficult patients do not want to participate. You may also have one or two challenging patients that never wish to do therapy because they are “too sick and tired.” There is also the patient who feels they don't need therapy because, in their mind, they are completely fine. Try these five creative ways to incorporate important treatment minutes which will benefit both you and the patient, and keep your supervisor happy. 1. Plan your treatment around a difficult patient's interests. The patient may always view you as the person that makes them do exercises. Don’t be a therapist that walks in with a resistance band and a closed mind. Ask the patient what activities they like to do. Perhaps they enjoy gardening, folding clothes, or problem-solving tasks. You can work on a range of motion and strength more effectively if you turn it into a meaningful task. This is especially true for patients with dementia, as they may be able to remember how to hang clothes in a closet, but be unable to follow directions during therapeutic exercises. 2. Ask if they need to use the bathroom. Occasionally you will have difficult patients that refuse to get out of bed. They may be tired, depressed, or just feeling lazy. A good strategy to get a patient out of bed is to ask them if they have to go to the bathroom (especially if you can catch them after lunch!) This way you can assist them to the toilet and work on transfers, functional mobility, dressing, hygiene and sitting and standing balance. Usually, once a person is out of bed, they are more likely to participate in therapy afterward. 3. Notify the nursing assistant (CNA) that you will be helping the patient with morning ADLs. Sometimes avoiding the use of ‘therapy’ when approaching a patient is best for those who are very unmotivated to participate. Tell the patient that you are simply there to help them get ready for the day. 4. Take the patient outdoors. Can you blame a patient for being miserable when they are cooped up in a room all day? Find out if the patient enjoys going outside. If the weather is nice and nursing approves, you can work on functional mobility, practice transfers, or work on standing tolerance. You can also sneak some dumbbells out, and once the patient is happily enjoying the sunshine, try working on upper body exercises. By taking the treatment outside you may be able to turn therapy into the time of day that the patient looks forward to most! 5. Ask for help with an activity. Skilled nursing facilities occasionally have patients who have very few functional deficits but have trouble with tasks that require memory, planning, or organizing skills. These patients are often reluctant to participate in therapy, as they don’t feel there is anything wrong with them. Rather than have them sit and stack cones, have this patient help you with a daily task. This may include sorting office supplies, cleaning the equipment or organizing cupboards. Giving the patient a meaningful and rewarding task may motivate them to participate in therapy and help them improve higher level thinking skills. But what if they still refuse? If all else fails, discuss with your supervisor about decreasing planned treatment minutes or schedule a case conference to determine why the difficult patients continue to refuse therapy. Always document the challenges that you are having and make note of subjective and objective observations. 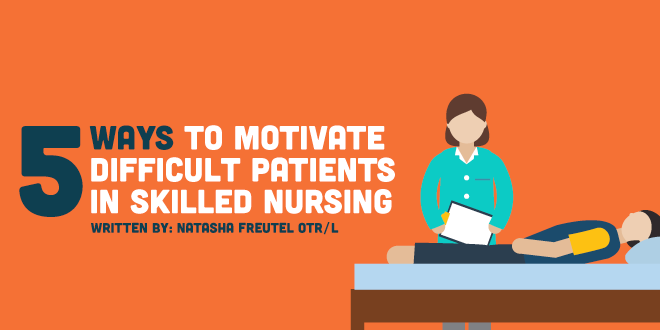 Keep in mind that many patients in skilled nursing are there because they are acutely ill or are no longer mentally or physically competent to care for themselves. This is why rapport building and explaining the benefit of occupational therapy is very important.